Saturday, September 5th, 2018 was a big railfan day for me – and not just for flying my drone. My youngest son was busy downtown for a while mid-day, so I had an hour and a half on my hands. As I usually do, I drove up to the CP yard to see what was going on there. I found an ex Rock Island car in the yard, now lettered FURX 815447. There was an ex Chicago and North Western car, AEX 21874, a few cars down. There wasn’t anything else going on in the yard. Normally I would go to the CP shops to see if there was anything interesting there, but there was a long, stopped, oil train in the way. Oil train… hmmm… sometimes there is some foreign power on those, especially on CP. I like those “Executive” BNSF units. This colour scheme was adopted by the Burlington Northern starting in late 1990. It was applied to some of their business train units, and then new SD70MAC BN 9401 came out with the new scheme. 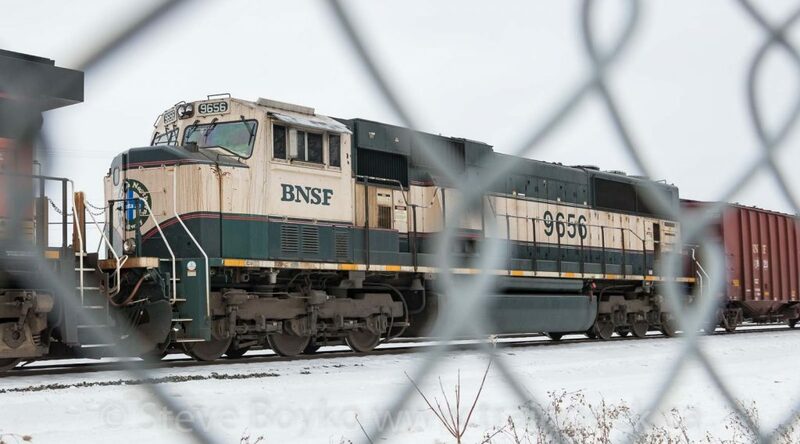 BNSF 9656 is one of that fleet of SD70MACs with the “Grinstein green” and cream colours. There are still some CP SD90MACs parked in the west end of the yard, near the intermodal facility. 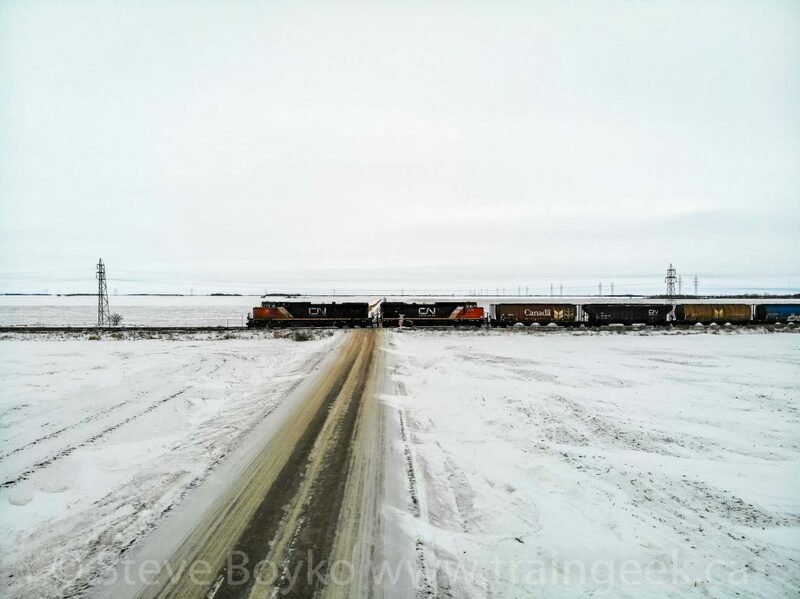 30 of those long-parked units are being rebuilt by Progress Rail into SD70ACU locomotives. 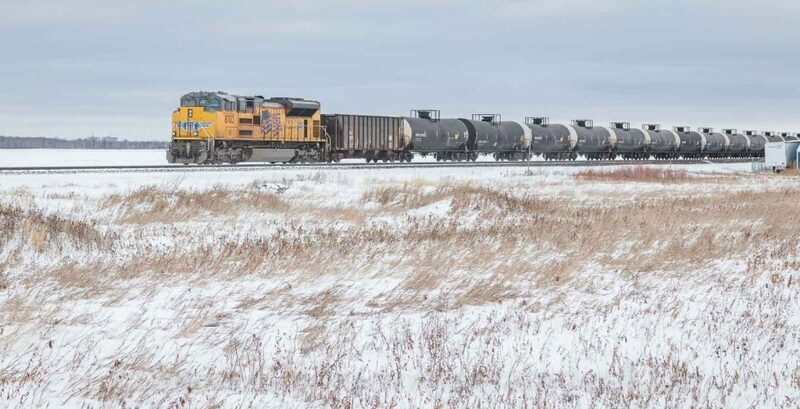 It ended up being a double-length oil train – the two BNSF units on the head end, a buffer car, a string of oil tanks, a buffer car – then two more locomotives and more tank cars! The two locos were UP 5552 and CP 8770. In mid afternoon I went out west of Diamond along the CN main line to fly my new DJI Mavic Air drone. As I was unpacking it and getting it ready for flight, I heard a horn from the west and I saw that a grain train was approaching. Up went the drone, and after I got the hang of flying it a bit, I took a few photos as the train went by. They were certainly nothing fancy, and neither was my technique – snap, rotate, snap, rotate, snap… but that Mavic is a great platform to take photos from! These were JPEG photos, not RAW format. I’m hoping the RAW format from the drone will allow me to brighten the shadows more. We’ll see. I had my video camera running on the tripod, and you’ll see and hear my drone buzzing around. I packed up my drone and started heading east. 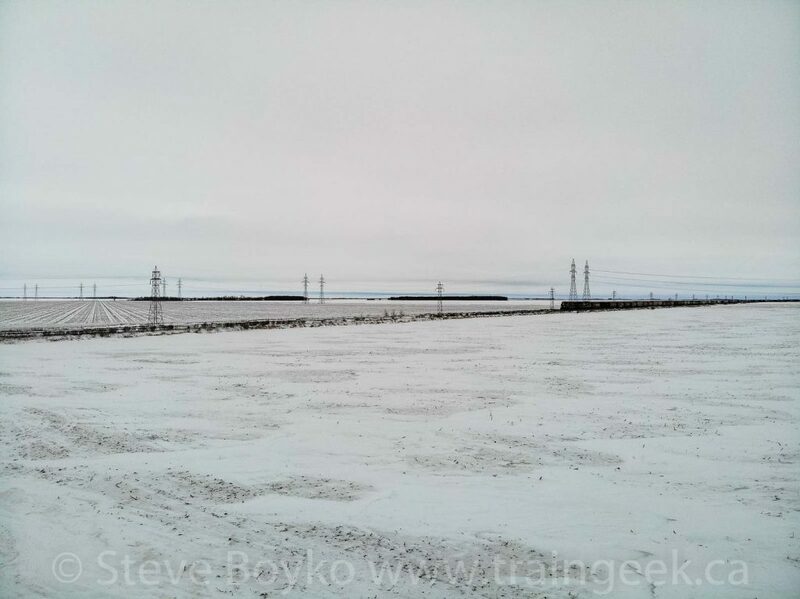 As I approached the Perimeter Highway, I saw a westbound train rolling by. After a careful U-turn (the roads were slippery), I overtook the head end and saw that they had eight locomotives. This I had to photograph! I tried to get far enough ahead of it to take video, but I was in danger of doing what I sometimes do – try to take video and photos at the same time, and do a poor job of both. I decided to just take photographs. Here’s the consist of this 8 locomotive train. 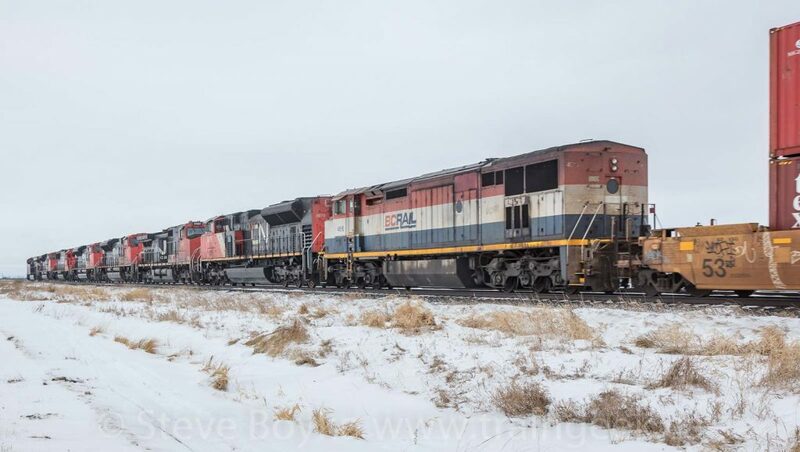 It had four SD70M-2 locomotives, one ES44DC, one SD60, one C44-9W (Dash-9), and a BC Rail C40-8M (Dash-8). It was an impressive lineup. As the head end receded, I saw they were meeting an eastbound oil train. I relocated a bit farther east so I could see the oil train approach. The oil train had CN 3031 on the head end, with an old SOUTHERN hopper car as a buffer car. I watched the oil train roll by. In the distance, I saw something bright and yellow on the other end of the train. 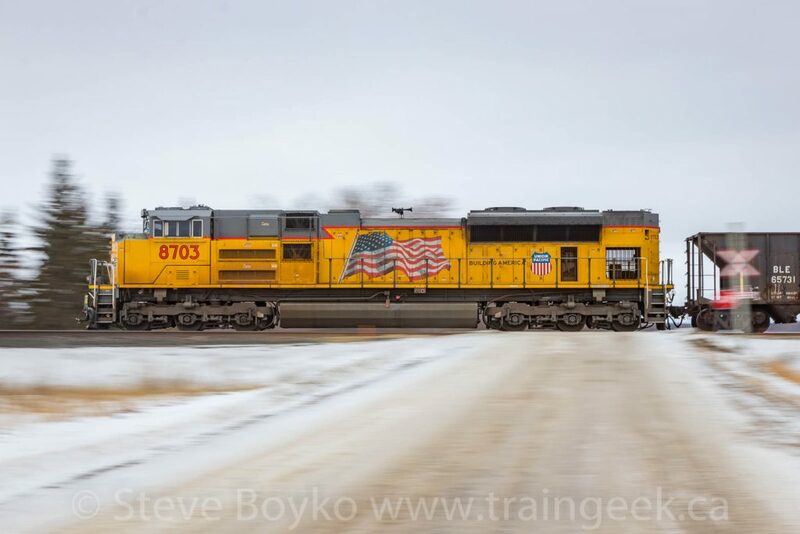 It turned out to be UP 8703, an SD70ACe. I had to get another photo of that Union Pacific locomotive. They weren’t going very fast, so I was able to get to Hall Road and take a few panning shots of the UP loco as it rolled by. I just finished reading Burlington’s Zephyrs by Karl Zimmermann. 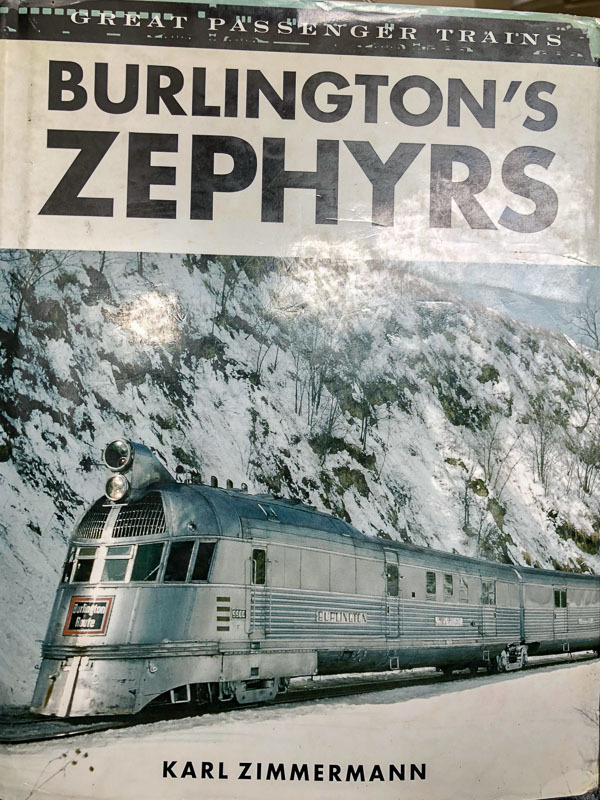 I didn’t know much about the Zephyr trains other than the weird shovel nose power units, and the intimate relationship between the Chicago, Burlington and Quincy RR and the Budd Company. This was a great book. Zimmermann went into great detail on the origins of the first Zephyr, its tours around the country, and the follow on Zephyr trains. Special attention was paid to the revolutionary Vista-Dome cars that the CB&Q and especially the California Zephyr were known for. Highly recommended! Buy it on Amazon or find it in your local bookstore or library. So not being knowledgeable about trains….why would it need 8 locomotives? Also I like the 2 UP8703 photos! Usually they only need two. 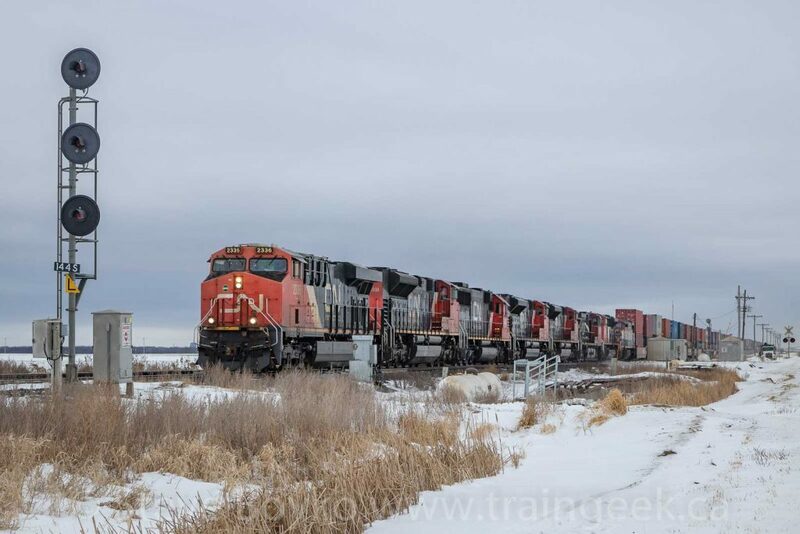 We railfans believe CN was just moving some locomotives west to where they were needed. 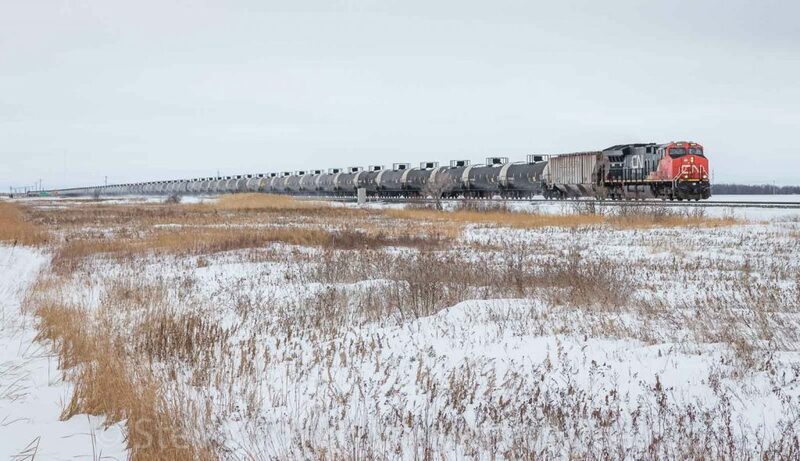 They would have been idling (to prevent freezing) but not pulling the train. Hey Steve, very nice pics! I look forward to you getting comfortable with your drone, because I think it’s going to open up a new door for you and your photography!